Recommended by the Pulse 1 Danny Mylo Breakfast Show with Danny and Rosie. 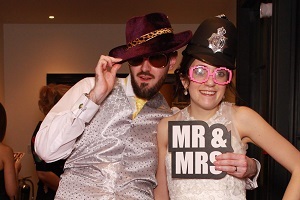 Hire a Silk Flower Wall from £100 when hiring a photo booth. If you like the traditional photo booth look this theme allows you to select from 8 curtains including Blue, Red, Purple, Green, Pink, Black & Silver. This is split into 8 further themes which all have 4 different backgrounds. These Include Disco Fever, Fireworks, Under the Sea, The Wild West and Pirates. This is split into 10 themes which all have 4 different themed backgrounds. These Include Jurassic 3D, Hollywood 3D, Rain Forrest 3D, Love 3D, Seasons 3D, Racing Cars 3D, Paradise 3D, Halloween 3D and Christmas 3D. The booth takes 4 pictures of you & places you on the front cover of a themed Magazine. There’s a choice of 5 magazines including wedding, music, party and film awards themed covers. This is split into 8 kids themes including Disney princess, super heroes, sea crazy and other popular movies. This is split into 8 holiday destinations of the world ( all which have 4 pictures) including, Egypt, Orlando, Las Vegas, Hollywood, Skiing in the Alps, Dubai & San Fransisco. This is split into the continents of the world ( all which have 4 landmark pictures) including Europe, Antarctica, Asia, Australia, Africa, North & South America The Caribbean. This superimposes up to 3 of your guests heads onto themed bodies. Themes Includes movie heads – Be Whisked away to Toy Story land, Shrek and Donkey in the forest, a wizard at Hogwarts or a mean Transformer, 007 – Become a secret agent, Superhero – Become a superhero in 4 Themed pictures, Outer Space – Be an astronaut or maybe an alien on mars.